The Treasury Department on Thursday imposed sanctions on two Chinese companies linked to illicit cargo transfers to North Korea in violation of U.S. and U.N. sanctions. The two companies, Dalian Haibo International Freight Co. Ltd., and Liaoning Danxing International Forwarding Co. Ltd., helped Pyongyang evade sanctions by facilitating ship-to-ship transfers of refined petroleum and other acquisitions that violate sanctions. 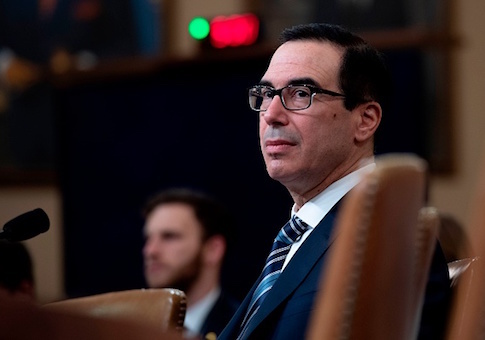 The sanctions imposed by Treasury block U.S. companies, including banks, from doing business with the Chinese firms, a designation that prevents the companies from using the international banking system. The action was taken by the Office of Foreign Assets Control, known as OFAC. The office also announced in a related action, along with the State Department and Coast Guard, release of an updated advisory that provides new details of North Korean sanctions evasion. The advisory identified dozens of ships engaged in ship-to-ship transfers of oil products or coal with North Korean tankers and freighters. "Treasury will continue to enforce our sanctions, and we are making it explicitly clear that shipping companies employing deceptive tactics to mask illicit trade with North Korea expose themselves to great risk," said Treasury Secretary Steven Mnuchin. The fate of the sanctions, however, was thrown into question on Friday after President Trump tweeted he was rescinding plans to impose additional, large-scale sanctions on North Korea. White House and Treasury officials could not be reached for comment on whether the president was referring to the sanctions announced on Thursday, or was canceling plans for additional North Korean sanctions. The Trump tweet stated that Treasury announced Friday the plans for additional sanctions. But Treasury made no announcement that day. It could not be learned if the president was referring to new sanctions beyond the two Chinese companies, or had misspoken about the sanctions imposed Thursday. "I have today ordered the withdrawal of those additional sanctions!" Trump stated. The sanctions are part of the Trump administration's campaign of applying pressure on the regime of North Korean leader Kim Jong Un to agree to give up its nuclear and long-range missile programs. Dalian Haibo was caught providing unspecified goods to North Korea's Paeksol Trading Corporation that is linked to Reconnaissance General Bureau (RGB), North Korea's intelligence service. Paeksol in the past was sanctioned for selling metal and coal from North Korea in violation of sanctions designed to pressure the North Korean government and ruling communist Workers’ Party of Korea. Dalian Haibo shipped goods from China to Paeksol in early 2018 and the items were traced to Nampo, a North Korean port. Liaoning Danxing was sanctioned for working with North Korea's transportation industry. "Liaoning Danxing routinely used deceptive practices that enabled EU-based North Korean procurement officials to operate and purchase goods for the [North Korean] regime," Treasury said in a statement. No details of specific activities by the two companies were disclosed. A Treasury spokeswoman declined to provide additional details. The shipping advisory updates an earlier warning about deceptive shipping practices used by Pyongyang. Those practices include the use of ship-to-ship transfers in international waters, manipulating automated ship identification beacons and physically altering vessels identification and cargo documentation. The updated guidance states that North Korea continued to evade sanctions through ship-to-ship transfers of petroleum and coal. In 2018, at least 263 tanker deliveries of petroleum from ocean-transfers were tracked to North Korean ports. "If these tankers were fully laden when they made their delivery, North Korea would have imported 3.78 million barrels, or more than seven and a half times the allowable amount of refined petroleum under UN Security Council Resolution 2397," the advisory said. The UN limit is 500,000 barrels a year. 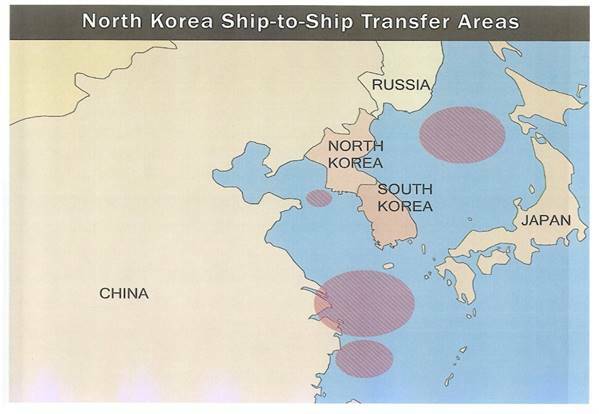 A map released by Treasury shows the locations of illicit ship-to-ship oil and coal transfers as taking place off the Chinese coast, in the Yellow Sea and Sea of Japan. Transfers of coal also took place in the Gulf of Tonkin near Vietnam. The new sanctions followed the publication earlier this month of a United Nations report describing "a massive increase" in illegal ship-to-ship transfers of petroleum products and coal by North Korea. "These violations render the latest United Nations sanctions ineffective by flouting the caps on the import of petroleum products and crude oil by [North Korea] as well as the coal ban, imposed in 2017 by the Security Council in response to the country’s unprecedented nuclear and ballistic missile testing," a U.N. panel of experts stated in a report. 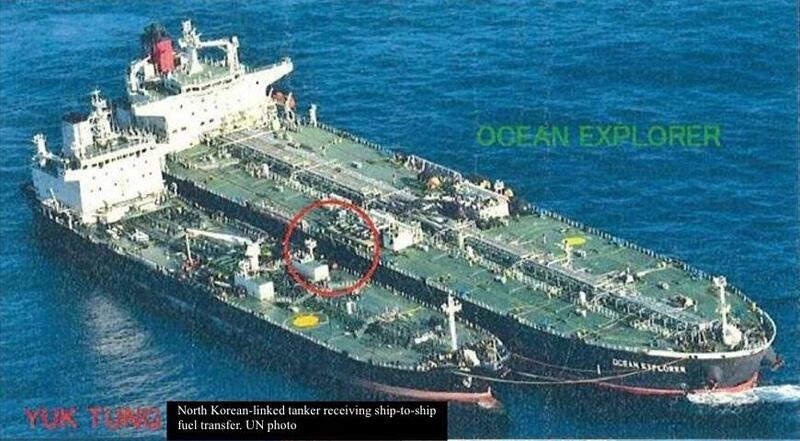 North Korea last year procured over 500,000 barrels of refined petroleum products through ship-to-ship transfers. One transfer identified in the report involved an at-sea transfer of 50,000 barrels of refined petroleum involving four Asians in a Chinese entity called Golden Luxury Corp. and the tanker Ocean Explorer to the North Korea-linked vessel Yuk Tung. A receipt showed the North Koreans paid $5.1 million for the marine fuel. "Global banks and insurance companies continue to unwittingly facilitate payments and provide coverage for vessels involved in ever-larger, multi-million-dollar, illegal ship-to-ship transfers of petroleum products, as well as an increasing number of ship -to-ship coal transfers and attempted transshipments," the report said. The report said North Korea was using advanced evasion techniques to disguise its oil and coal purchases, including ship global positioning signaling known as automated identification system, or AIS. "The manipulation of vessel AIS transmissions remains an overarching feature of illegal transfers, contrary to International Maritime Organization (IMO) regulations governing safety of life at sea, which require that AIS be in operation at all times," the report said. The North Koreans also have used physical disguise of tankers, the use of small unregistered vessels, illegal name-changing, night transfers, and other identity fraud. The North Koreans also are "routinely" providing safe harbor for hijacked ships, the report said. Also, "ports and airports in [North Korea] were being used for rampant violations of the resolutions, ranging from illegal oil imports and coal exports to the smuggling of bulk cash by nationals." The report also disclosed new details of North Korea continuing to build missiles and develop nuclear weapons at civilian site, to avoid feared missile attacks on its weapons facilities. This entry was posted in National Security and tagged China, North Korea, Sanctions. Bookmark the permalink.